Disclosure: When I wrote this post, I had absolutely no affiliation with Progressive (the makers of VegeGreens). I simply liked their product and wanted everyone to know how I felt. As always, the Loving the Bike reviews is totally and completely a 100% honest review. Anyway, after the post went out Progressive found out about it and were very pleased to see what was said about their product. So impressed that they wanted to become a sponsor of this blog. So when you read this review, please be ensured that what was said about this product was a completely honest and non-biased opinion. I’ll guarantee that this product is not normally found in most cyclist’s kitchen cupboards….but it really should be. VegeGreens by Progressive is a self proclaimed “Ultimate Super Food”, and in my opinion they aren’t far off in that statement. 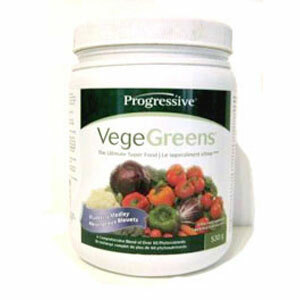 Get this, VegeGreens is packed with over 6o land, sea, and cruciferous vegetables. If you don’t know what cruciferous vegetables are….let me say this, it’s the scientific name for a group of vegetables that just might provide protection against certain cancers. They contain antioxidants and are high in fiber, vitamins and minerals. Examples of cruciferous veggies are broccoli, kale, cabbage, rutabagas, and turnips. Okay, so why do I think you need to get this stuff into your kitchen cupboard? Well, I would say that there is a lot of great foods and supplements that will help make you a better cyclists and help increase your athletic performance….but the benefits found in just one small scoop of this bad boy can’t be beat. Of course it would be better to go out and shop for each of these 60+ ingredients and get them fresh….then clean and cut them and blend them up into a drink. If you have the time for that, I say go for it. But if you want all this goodness with the simplicity of just having to mix it up in a glass of water, you’ve got to get on board. You know what? VegeGreens doesn’t even have any artificial flavors, colors, or sweeteners….so it really is the absolute closest thing to the real deal. The first day I took VegeGreens was about a month ago. I’m not sure if it was psychological or really happening, but I swear that my immune and digestive systems were smiling from the moment I chugged back the glass. We all know that we’re supposed to take our vegetables, but what’s most important is getting the right vegetables inside of you. Taking a look through the ingredients of VegeGreens….I cannot find anything that could possibly be missing. This stuff rocks, and it’s got what your body needs. I can’t guarantee that it will make you a better cyclist, but I can guarantee that it will help keep your body functioning at it’s highest level. Try telling me that won’t do something for your cycling. VegeGreens is not cheap….well at least it doesn’t appear to be at first. Picking up a small container for $60 sort of makes you shake your head when walking out the store. But it works out to about $1 per serving and in today’s world, that isn’t too bad. If you’re wanting to make it last longer, I would suggest taking it every second day and at that frequency it will still be valuable to your body. I was going to list off all the benefits taking VegeGreens will provide you with, but that would make for a very long list. So please visit their benefits page and see why there isn’t too much this stuff won’t help you with. I should also mention that you should steer clear of it if you’re a child, pregnant, or lactating. This was actually an issue here in my house. My wife is currently breast feeding our 2 month old baby boy and I really couldn’t see it being a problem. But it does say this on the label so we checked it out with our family doctor and he suggested doing as it says. That’s good enough for me and she’ll be off it for now. I really am impressed with this stuff and I know there are other similar products in the market, but I’m standing behind Progressive and VegeGreens. I’m sold on the benefits it provides and I’m suggesting this to you because I honestly feel that everyone should be in-taking what this product has to offer. Progressive is a Canadian company, so if you aren’t able to pick it up in your local health food or grocery store, ask them what they have in the way of Phytonutrients or “Green” veggie mixes. Get this stuff in your cupboard and then come back and tell me how glad you are that I pushed you into it. What a fantastic post! This is so chock full of information I can’t wait to dig deep and start utilizing the recources you have given me. I, too, don’t lack energy but bowel function regardless of water intake, exercise and nutritious diet do not aid in relief of constipation or slow transit. I tried it fir the antioxidant benefit and am very, very pleased with the additional help it has provided in bowel help. The greens were suggested to me by two other individuals suffering the same issue. Give it a try. I don’t want to be without it. I am very confused by this product. It states that it provides the nutrients of 6-8 servings of vegetables but nowhere on the container or on their site can I find the nutritional information – just the list of ingredients. Most of the ingredients are in microscopic amounts way below their recommended therapeutic dosages. How can I find out, for example, how much vitamin A is in a scoop? If I am supplementing with a vitamin and also taking this how do I know if I’m getting the right amounts when the amounts aren’t listed? I just bought this product and I do love the list of ingredients, but I am very confused about why they won’t tell us exactly what vitamins and minerals we are getting and at what percentage of the recommended daily amount. I am beginning to wonder if this isn’t just great marketing, but I actually would like to be proven wrong on that one. Sorry to hear about that. It’s been a few years since I’ve used the product so I can’t help you out with any answers. Thanks for letting me know. I have the exact same concerns. I wrote to Progressive and asked to be provided the daily nutritional value of Vege Green, either in percentage of daily requirement of by volume. No response. When you consume this product, you have no idea how much minerals and vitamins you are actually consuming. Very frustrating. I’m sorry they company is not helping out. I don’t have connections or affiliations with the company so I can’t check on it for you. 2018 Update: I am sitting here with a Progressive VegeGreens Multi right here beside me, and am pleased to let you know that the label includes a list of vitamins with the quantity of each for every scoop, plus the same for Minerals, followed by the extensive list of ingredients. I wondered, Darryl, why you stopped using it.. Not a judgement, just curious.. Thanks for the update, Janine. That’s great to know. I don’t really have a reason for why I stopped using it. I think it was a good product, I guess I just decided to stick to raw food instead of supplements. Thanks for adding your comments, Lorne. Good to hear that you’re enjoying Vegegreens. Any experience that veggie greens assisting with chronic constipation/peristaltic paralysis? I don’t lack energy at any time but suffer from the paralysis. That’s a great questions, Shaun. You’ll have to contact the company directly to find out about that one. Thanks. I just bought a large container of veg egreens Citrus Splash flavour yesterday. It tastes pretty good, I mixed it with a protein shake. I hope I have good results from it. Great to know I should keep it in the fridge. I just got a sample of Vege Greens yesterday, it is flavored with peanapple coconut and so it taste very good. I’m really impressed. I figured that instead of spending my money on vitamins, extracts, even protein shake, I’ll just buy a container of Vege Greens. It is really important, and it make me feel better. Is the phytoberry AND vege greens safe for vegans? I agree on all accounts. someone at work hooked me on this stuff. Not only do i feel better, but two weeks into it, i had lost 15lbs and gone from a lifetime of 210/105 blood pressure to 135/90 which is boderline normal. Thank god for Vegegreens!!!!!!!!!! stuff is awesome, it balances out my whole body and gives me good energy and a better sense of well being. So cool, SOMETHING cheaper in Canada. I was at Kardish looking at supplements, noticing Vegegreens I thought they looked like they might be good and affordable, worried about taste though. The one I using now, tastes like dirt and no amount of berries improves it. I will giving Vegegreens a try, very happy they are 2 minutes away and I don’t have order them online from the States. Kardish is right beside a Qiznos too, my guilty pleasure. It tastes awful, but I love it! this stuff just makes you feel amazing, more energetic and otherall just better. hard to pinpoint the effects but I am thoroughly surprised despite my initial skepticism. I’m entering in a new life since I began to take vegegreens and phytobery. These products are awesome. I had digestive problem since many years and I feel the differences after the first try. That product really worth much more than the money you spend on it… I tried a lot of similar and expensive digestive products with poor results. It’s miraculous for me, I’m almost breathless. I’m not used to take nutriment shake and I think that the taste is not so bad. It’s strange to feel the taste of alga and berry in same time but it doesn’t matter for me. Before, it was tough to get threw a working day, but now I still full of energy even after a rough day. Glad you like it, John. Thanks for your comments. I have been taking vege greens for a week and I cant begin to tell you how much better I feel!! more energy, I think more clearly, I sleep better at night, and when I get up in the morning I feel awake, instead of wanting to crawl back under the covers!!! I mix it with some OJ in the morning and I`m good for the entire day…..I dont feel I need my old man nap in the afternoon. I really liked this info shown it has given me a bit of inspiration to have success for some reason, so keep up the good work. Thanks for your comments, Ellie. As you and Sabina mentioned, products like these should always be kept in the fridge…..they should really list that on their label as it doesn’t say anywhere on it to do so. With all the nutritional products out there its hard to know which are actually good quality ones and worth taking. Progressive is one of the first that I’ve come along in a while that makes me feel this way and it’s good to hear the same thing from others. I wouldn’t recommend it if I didn’t completely believe in it and I’ve very happy to have come across it. For an extra boost you can try the VegeGreens Vegan Protein. It’s got it all! And it’s super tasty blended with a banana and some almond milk! I normally mix it with phytoberry to make it taste better but I will def try it instead with a banana and almond or coconut milk tomorrow. 🙂 Thanks for the tip. I go back and forth between it and Vega CWHO and am never sure which is a better product. Let me know what you think about it, Robert. Good advice…..thanks for dropping by and leaving your comments. I can’t wait to be able to take this stuff again. It seemed to give me a much needed boost in the morning, that lasted through the rest of the day (with a balanced diet of course)…..and with a taste that was pretty decent. I’m also sold on this stuff!! I will be adding this to my grocery list. Thanks for the tip. Good to hear it…..let me know if you’re able to find it in the States. If you can’t get VegeGreens, there will be something similar for sure. I’d never recommend it if I wasn’t 100% sold on the product….I know you’ll dig it. Once you try it out, check back and let me know your thoughts. VegeGreens will be available at Health Food Stores in the U.S. early June 2010. (Whole Foods Market, Vitamin Shoppe, Henry’s and Independent Health Food Stores) The Brand Name in Canada is Progressive and in the U.S. the Brand Name is Proventive. The formula’s are exactly the same. Thanks for providing this great information, Joanne. I know our readers will find it useful. Good luck with your US launch and I’m looking forward to talking to you guys about partnering.